Ranti Martins assisted East Bengal club defeat Shillong Lajong on Tuesday afternoon in the I-League, notching a hat-trick in a 4-0 rout over the visitors. The homers had a good start, scoring through Martins in the 17th minute before the prolific striker picked up his second goal of the game in the 26th minute. On 37 minutes, the 29-year-old put East Bengal 3-0 up, finishing a move that he started, before Jairu added more gloss to the scoreline seven minutes out of intermission. 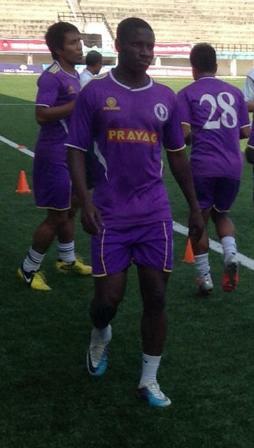 Ranti Martins has now scored 7 goals in his first 7 matches of the season in the Indian top division. Three Nigerian players - Martins, Bello Razaq(East Bengal) and Penn Orji (Shillong Lajong) -were handed starting berths at Barasat District Sports Stadium Kolkata and the trio lasted the distance.